I’m not sure if my daughter will like this, but I’m posting the picture, anyway. My shy little girl joined (through her classroom adviser’s encouragement) to join a popularity contest (based on ticket sales) at her former school. Isn’t this a nice entry for , and ? My daughter was wearing a yellow-gold gown. She was crowned Second Runner-Up for Ms. Our Lady of Carmelite Academy in 2004. She was only six here and a first grader. The floor and the gown of the girl next to my daughter and her cute partner are blue. The stage adorned with red cloth was decorated with artificial flowers. 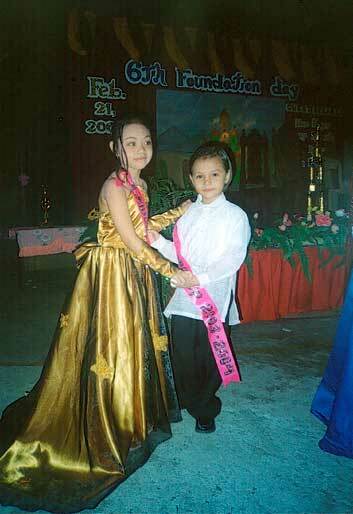 This entry was posted in Ruby Tuesday and tagged coronation, coronation night, girl in gown, gold gown, popularity contest, yellow gown on January 31, 2011 by Yami. They don’t look blue, but the carpet and table cover are blue. girls love to dress up–pretty gown. That is a darling shot of your precious little girl and her. That is quiet an honor for her. nice young couple. one of the things i want to experience back when i was younger. am ur new follower.cheers!